Koroit, a rural township in western Victoria, is north of the Princes Highway between Warrnambool and Portland. Koroit’s origins lay with the Tower Hill caldera, the collapsed summit rim of a large volcanic cone about 3 km south of the town. Inside the rim there is a lake, nearly forming a moat around several islands. A peak on the large island was seen by French sea explorers in 1802, and was identified by Matthew Flinders as ‘Peaked Hill’ in the same year. The resemblance of the caldera to a moat and castle probably inspired Crown Surveyor Pickering (1842) to name the peak Tower Hill. It is thought that the Aboriginal name of the large island was the origin of the name ‘Koroit’. The country around Tower Hill was fertile, with fern and tree cover, and occasional low flats. After pastoral occupation (1840s) there were large allotments selected around Tower Hill during 1852-54. South of Tower Hill, however, there was Rutledge’s Special Survey (8 square miles), and this restricted closer settlement except under lease. Attention thus turned to freehold possibilities north of Tower Hill and in 1857 a township, named Koroit, was surveyed in that area. The population was quite concentrated as there were Anglican, Catholic and Presbyterian schools opened during 1850-57, and a Common School in Koroit itself (1857). The last mentioned building is near the public gardens and is on the Register of the National Estate. 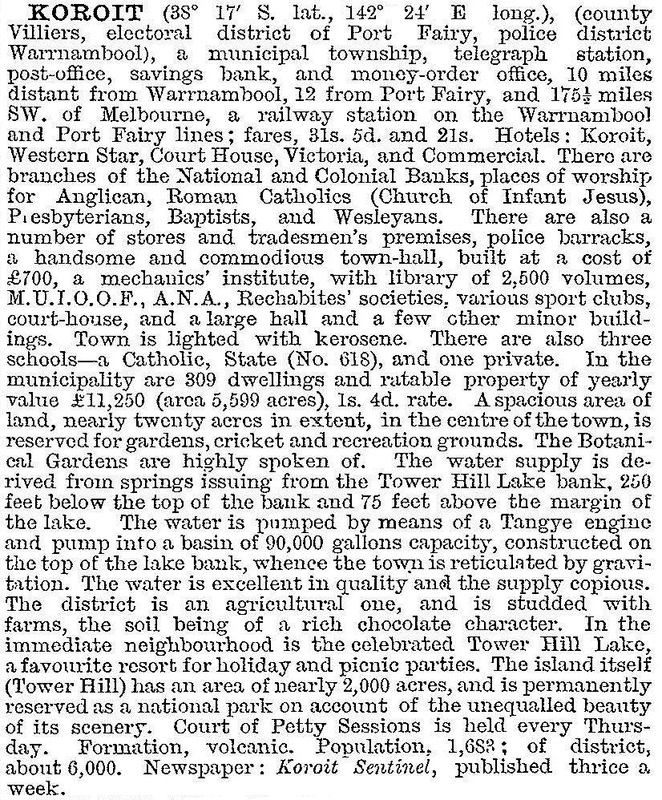 In 1865 Bailliere’s Victorian gazetteer estimated that the population of the Koroit district was about 1000 persons. A considerable amount of locally grown wheat was milled at Koroit, and the township had two hotels, a court house and a post office. 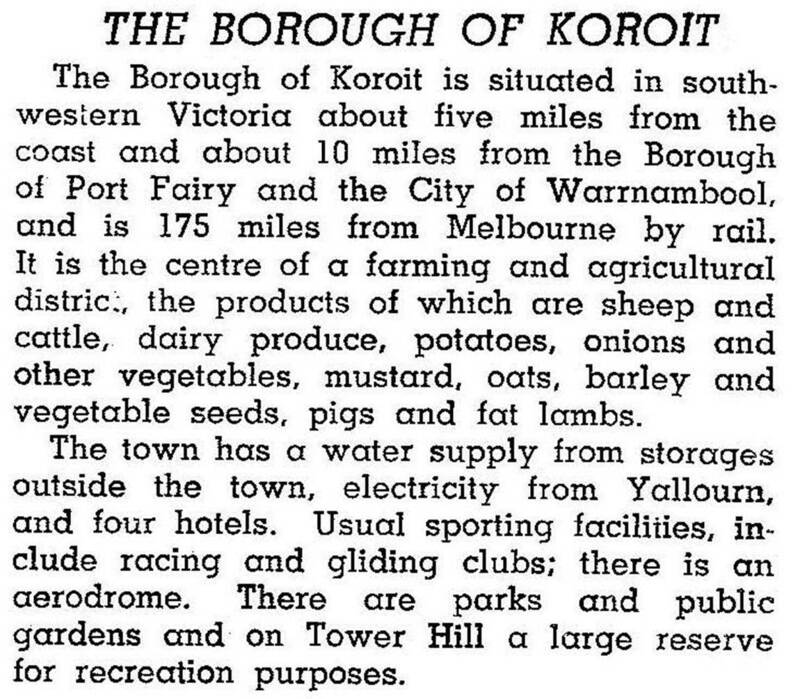 On 7 October 1870, Koroit was proclaimed a borough, when its population was about 1600 people, a figure which remained fairly stable until the 1930s. The Koroit and Tower Hill Butter Factory was opened in 1889. Koroit has a high Irish-Catholic population, whose farmers have engaged in dairying, potato and onion growing and general grazing. Catholic buildings became the most dominant in the town, comprising the church and presbytery, St Patrick’s school and the former convent of the Good Samaritan Sisters. (The convent was later used for hostel purposes). Koroit was connected by railway to Warrnambool and Port Fairy (1890) and northwards to Hamilton (1890). All lines were closed in 1977, by when road transport catered for passengers and freight. Since the 1970s the Koroit and Port Fairy districts have developed tourist and cultural interest in their Irish heritage. The Port Fairy Folk Festival has become a major annual event each March, and there is a Koroit Irish Festival. Koroit’s commercial area has acquired antique and curio shops, notably the Courthouse Inn. There is also an annual agricultural and pastoral show. Several buildings have National Trust citations, including the post office (1872) where Ethel (Henry Handel) Richardson’s mother was postmistress. Her father, the model for Richard Mahoney, lies in the Tower Hill cemetery. Nobel prize winner Sir Macfarlane Burnet, is also buried there. Secondary industry is dominated by the Murray-Goulburn factory (milk powder and fresh dairy products) employing about 120 people. The factory began as the Koroit and Tower Hill Butter and Cheese factory (1888), which took over the Grassmere butter factory in 1958. Murray-Goulburn took over the Koroit plant in 1966 and centralised many of its Western District operations at Koroit. Koroit has a shopping centre, two hotels, a recreation reserve and public gardens, facilities for bowling and croquet, State and Catholic schools, Catholic, Anglican and Presbyterian churches in a precinct south of the botanic gardens, a health service in the former hospital and a caravan park. In 2014 the State school had 121 pupils. The Tower Hill reserve, after being over-grazed since the 1870s, was revegetated during the 1960s to 1980s. It has a Natural History Centre designed by Robin Boyd. Koroit borough was united with Warrnambool shire on 1 October 1985. On 23 September 1994, it was transferred from the Warrnambool district to the Port Fairy district by becoming part of Moyne shire.